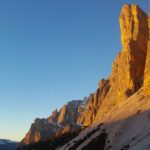 This has been the second december in a row without snow. 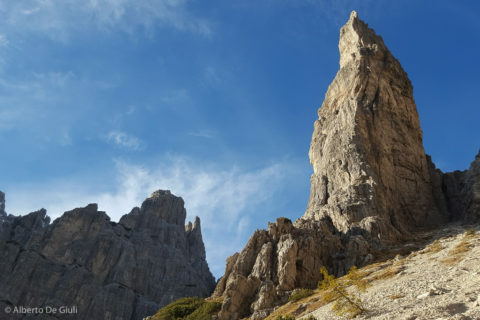 Just a matter of bad luck? 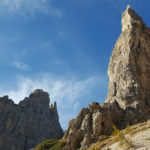 A cycle or is it been all because of the climate change? 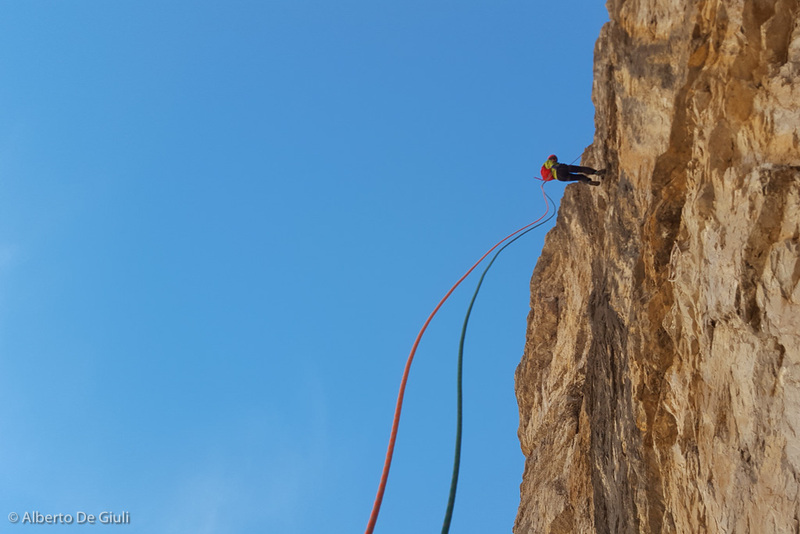 I think it’s a bit of everything. 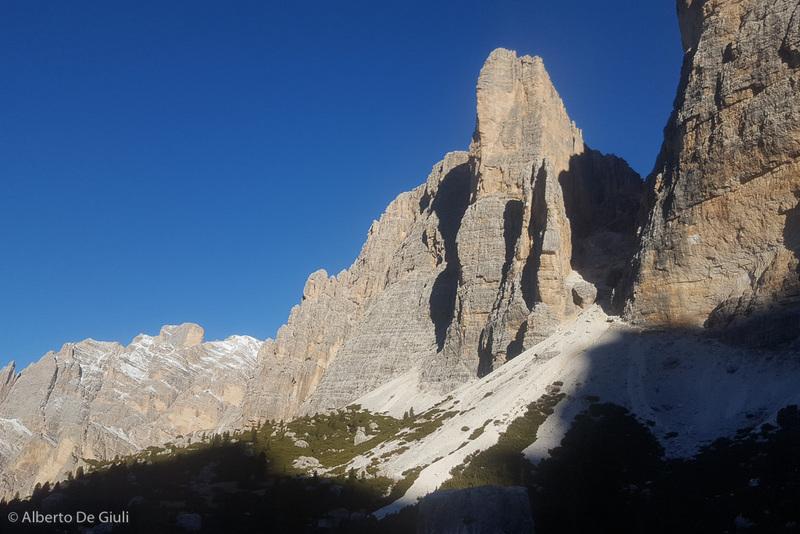 The high pressure is still strong in Europe and in the Alps, it’s been three weeks already with beautiful days from sunrise to sunset, and winter season is starting in two days. 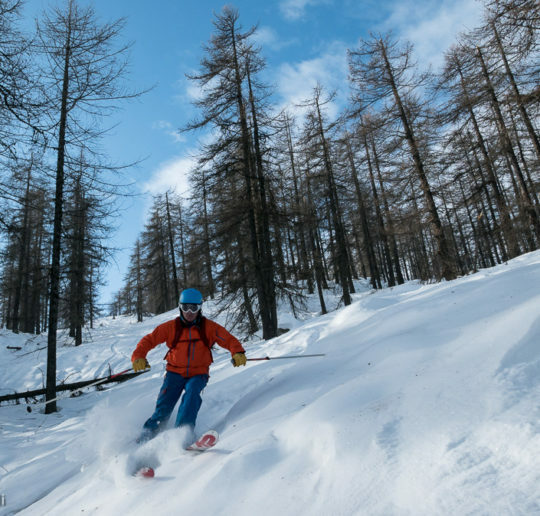 For the people like us who want to ski, what can we do if we refuse to ski down those white stripes of manmade snow? 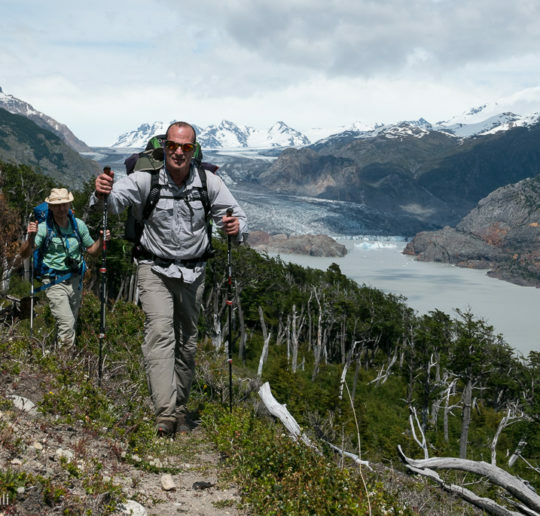 You know, I’m not desperate at all, I’ve been trying to do what nature has been offering to me. 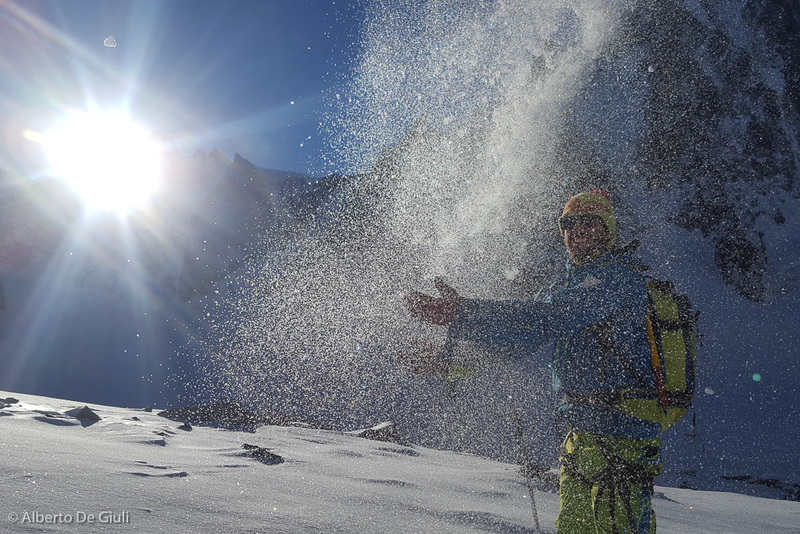 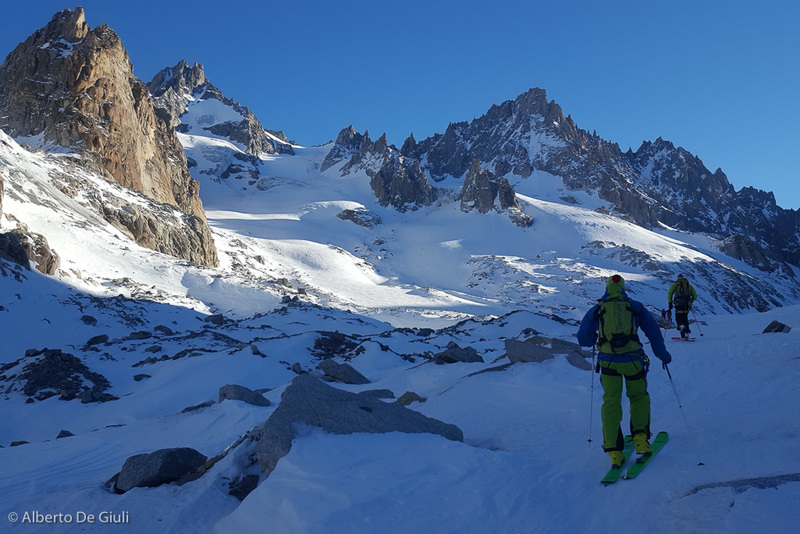 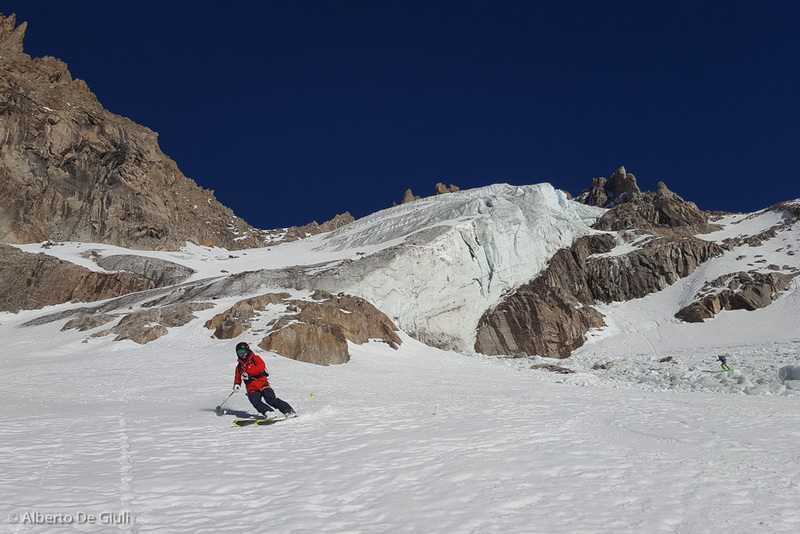 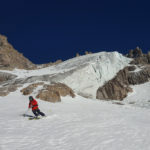 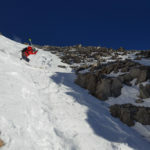 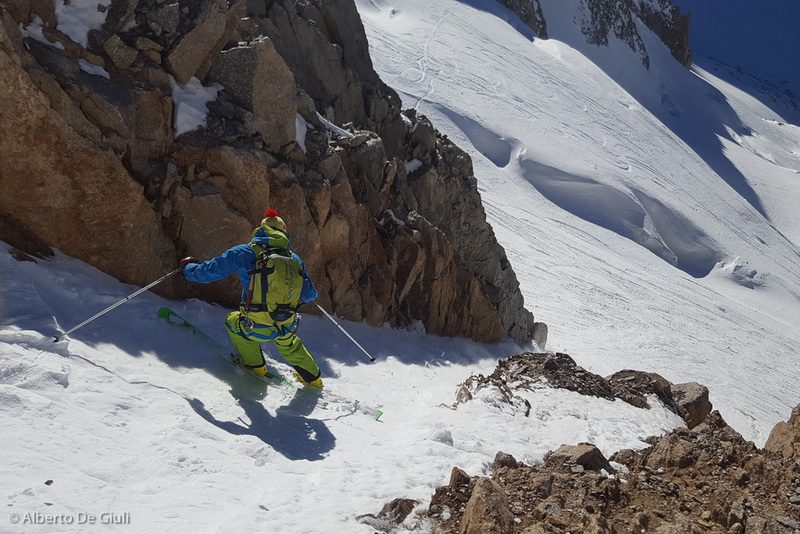 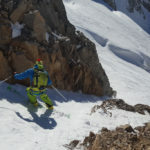 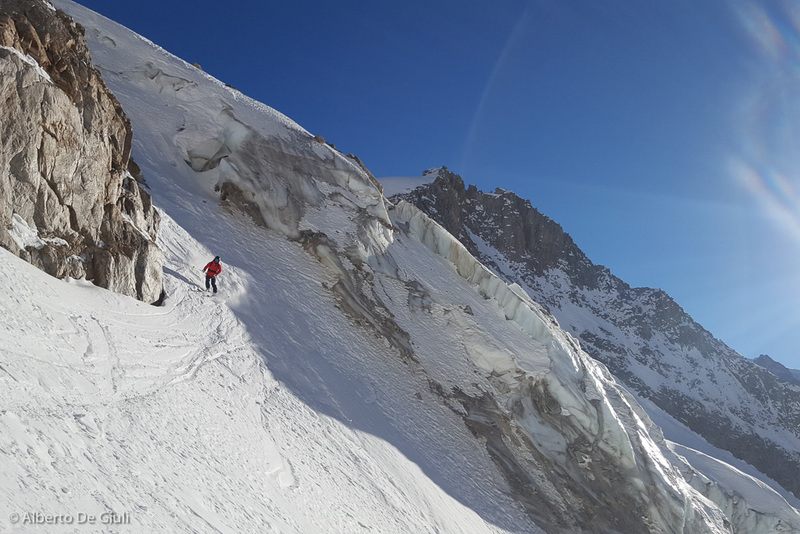 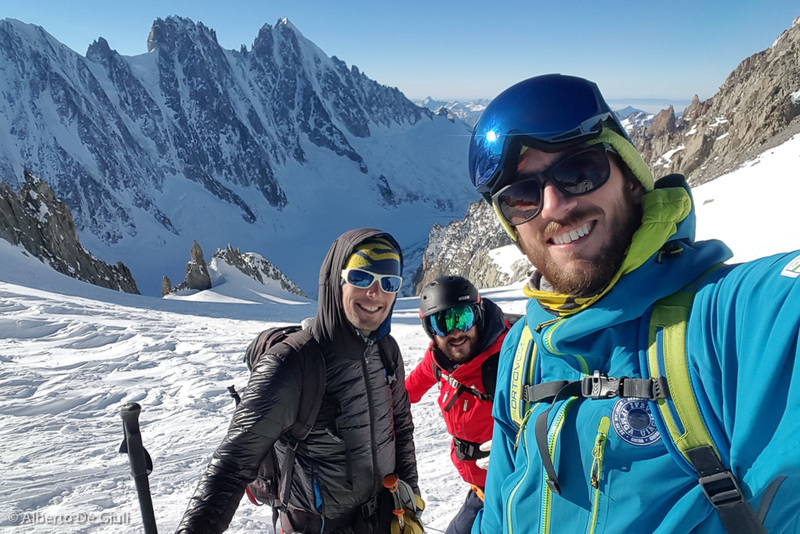 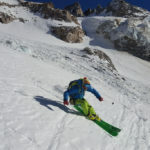 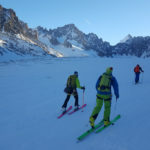 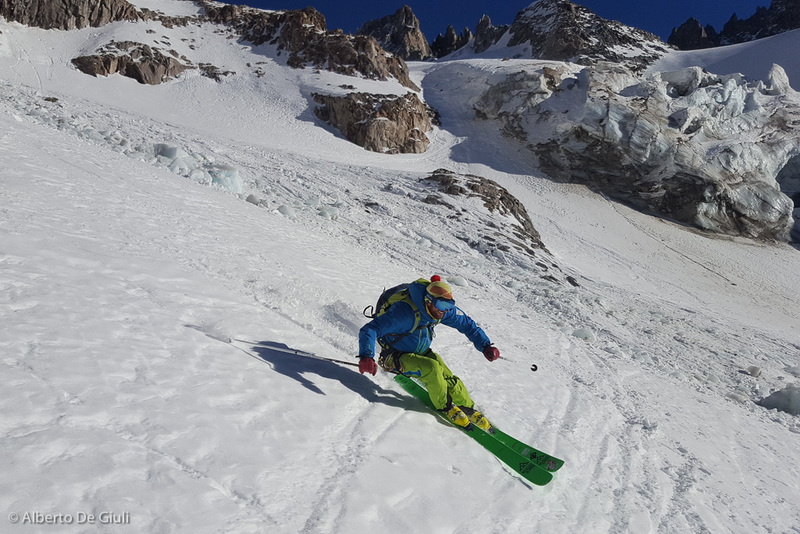 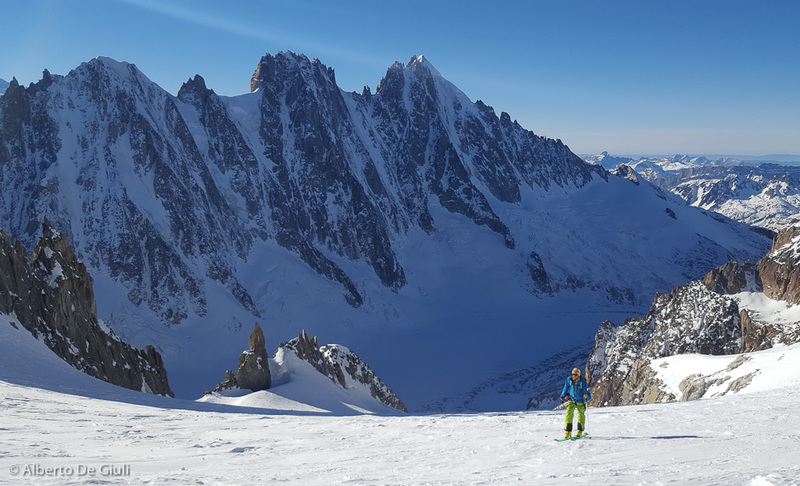 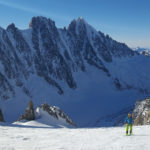 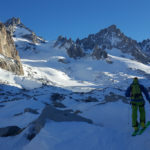 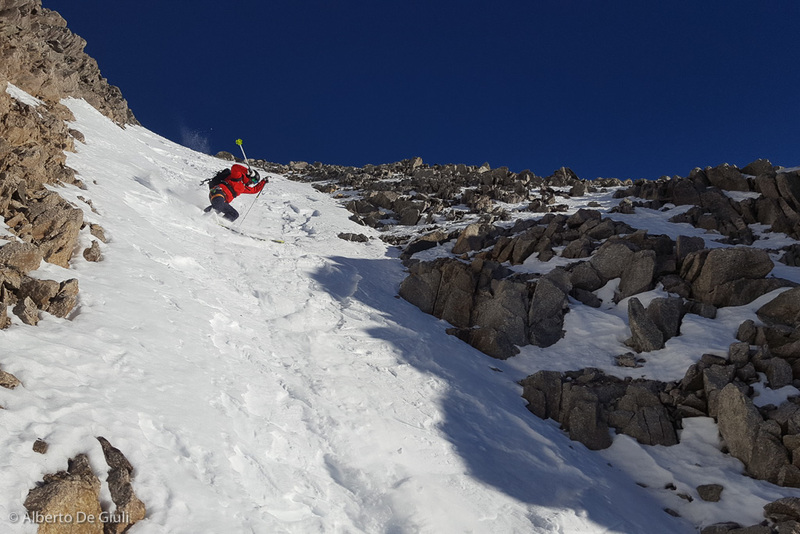 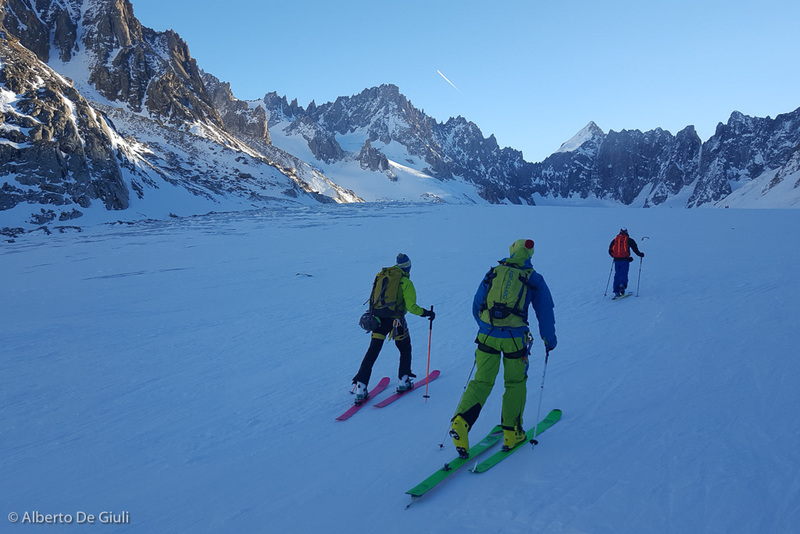 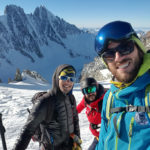 To do what I call “skiing” I went to Chamonix for couple days at the beginning of this week, on the Argentiere basin you can do some nice ski touring, we skinned up tothe Col d’Argentiere on a beautiful sunny day, and we found good snow for skiing down as well. 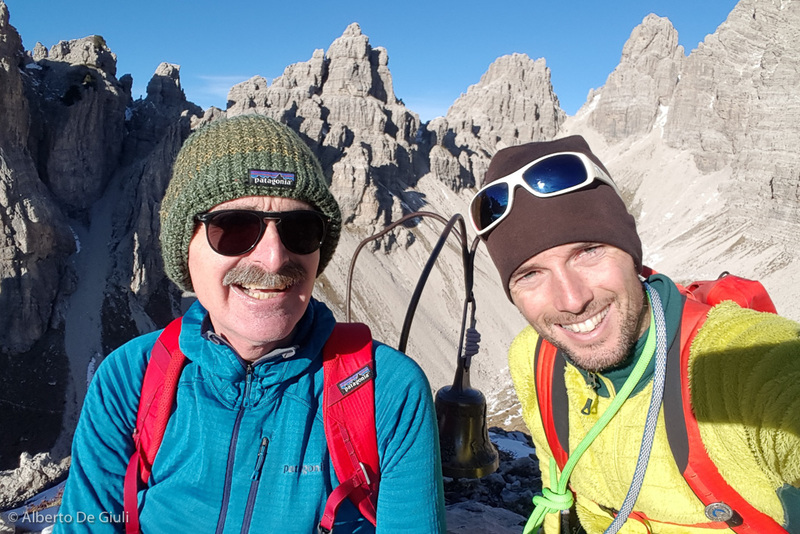 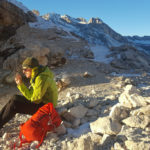 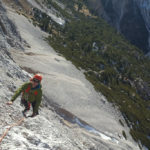 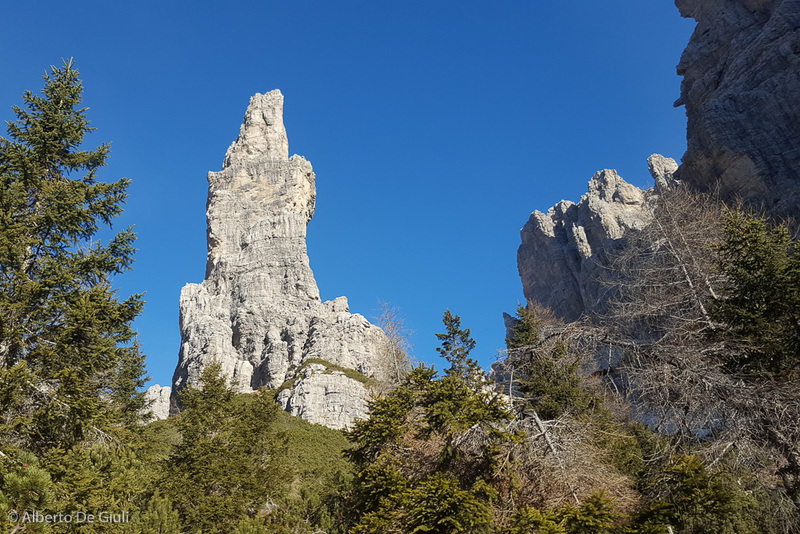 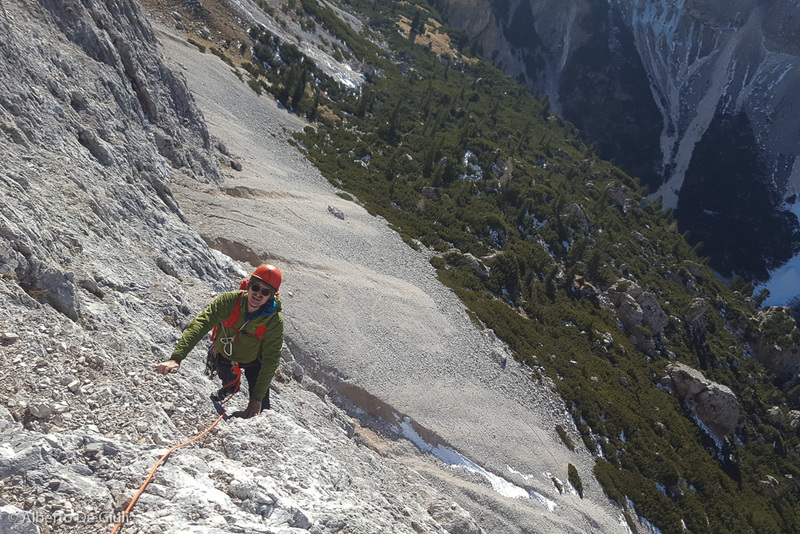 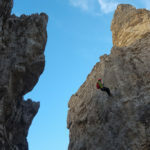 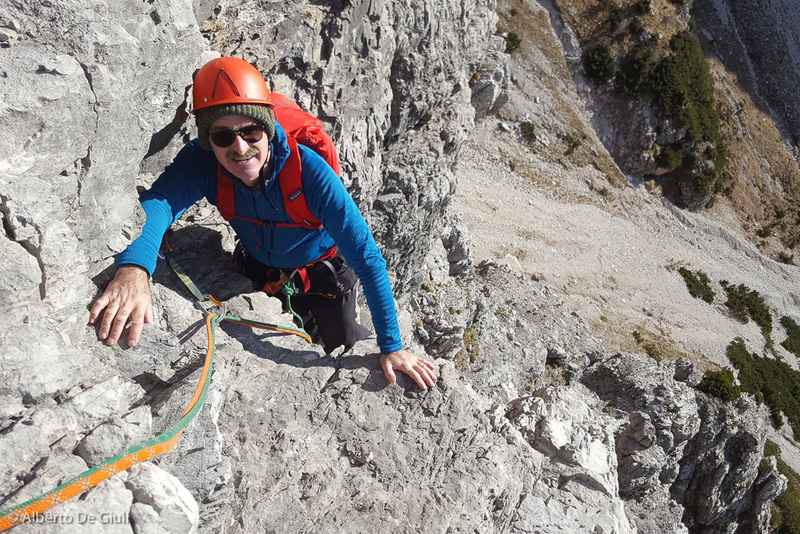 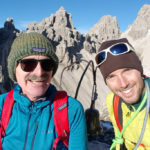 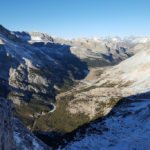 Here in the Dolomites we have had the opportunity to climb some route on the sunny faces, thanks to the thermal inversion that has kept warm temperatures up in the mountain. 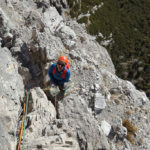 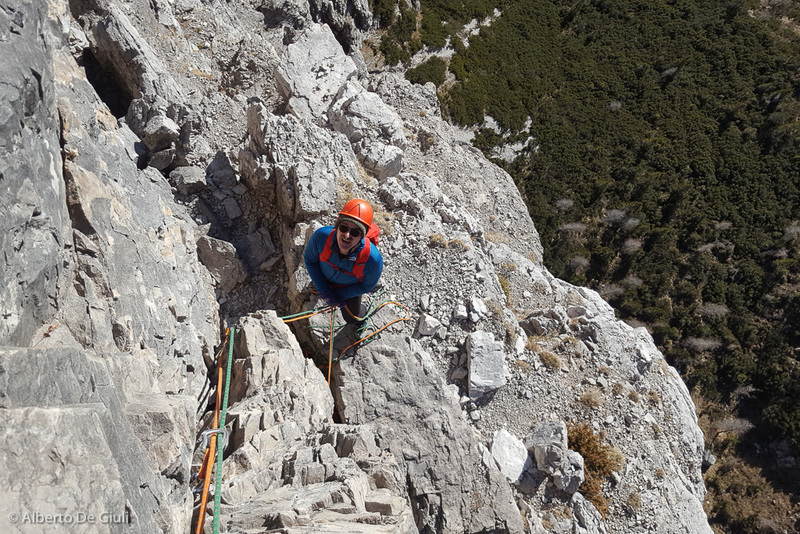 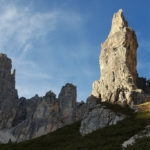 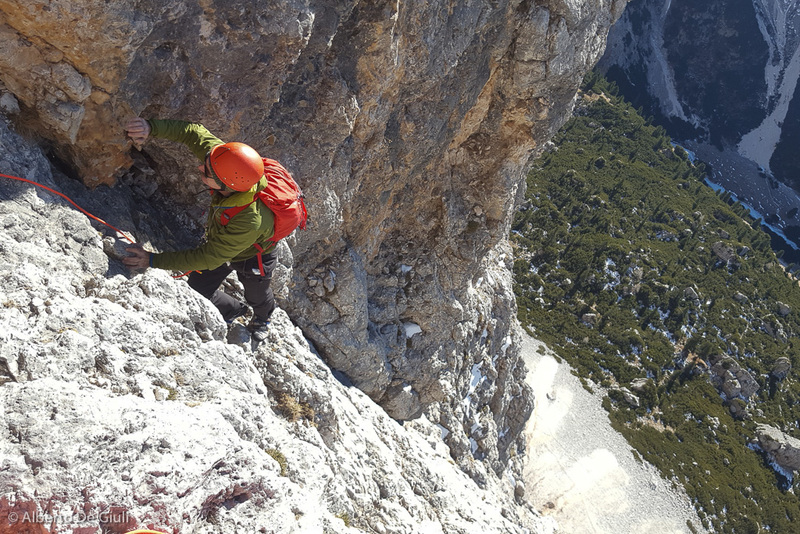 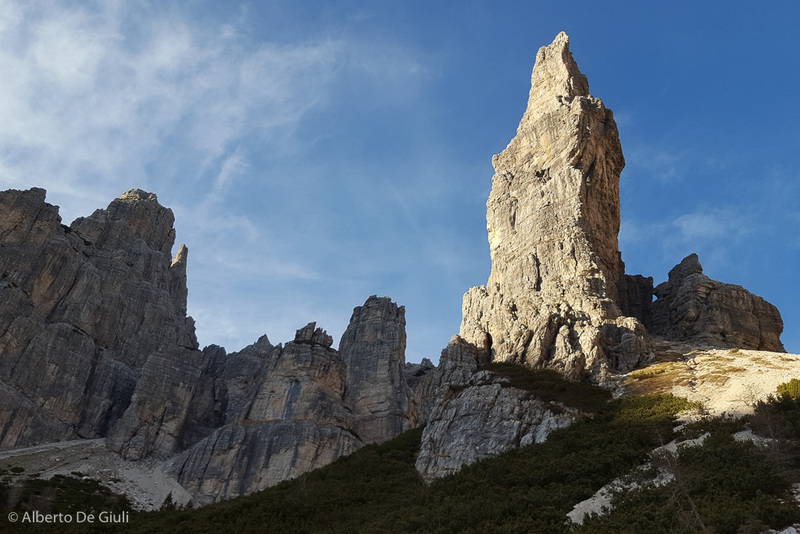 The dihedral Dall’Oglio on Cima del Lago is a classic climbing route graded IV, always worth a visit. 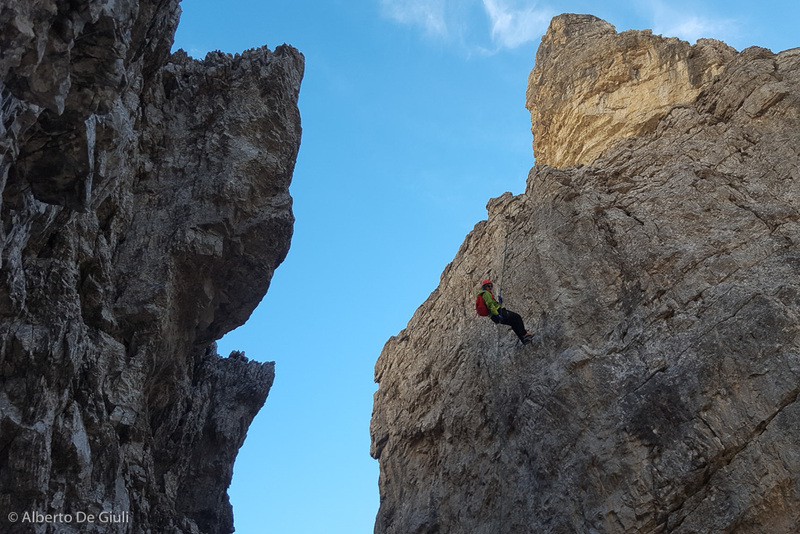 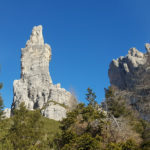 Yesterday I had the opportunity to climb the normal route on Campanile di Val Montanaia , a masterpiece of the rock climbing history, on a unique rocky tower surrounded by the jagged towers of Spalti di Toro (Campanile di Val Montanaia is also called “the scream of rock”). 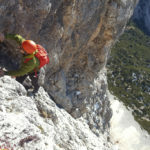 Its normal route was first climbed in the 1902, the first part by two Italian climbers and the rest by two Austrians, it’s impressing the boldness shown by these guys in the two key pitches, the “Cozzi Crack” (five meters of V grade that requires strength and good technique) and the ” Von Glanvell Chimney “(an overhanging chimney rated IV+, that starts from a tiny and exposed ledge 400 feet from the ground). 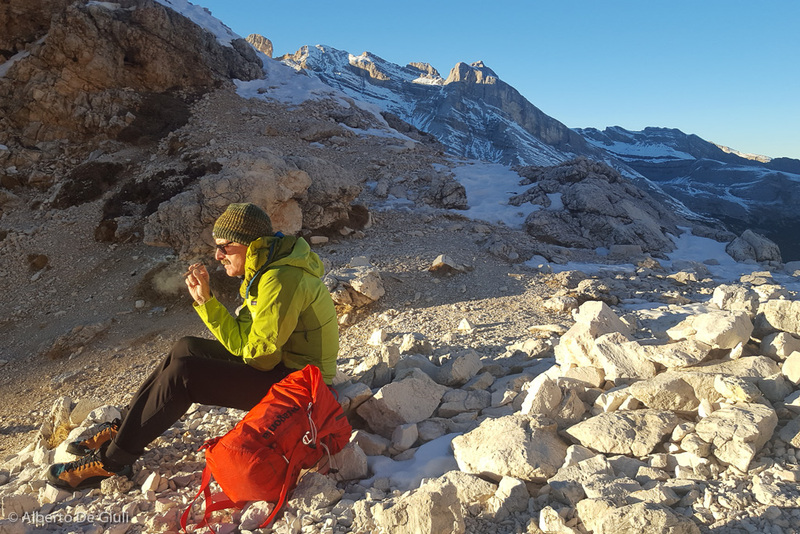 For who have been lucky and pleased to be up in the mountain during these days, you can just appreciate the sound of silence, the feeling of wilderness that only remote places can give. 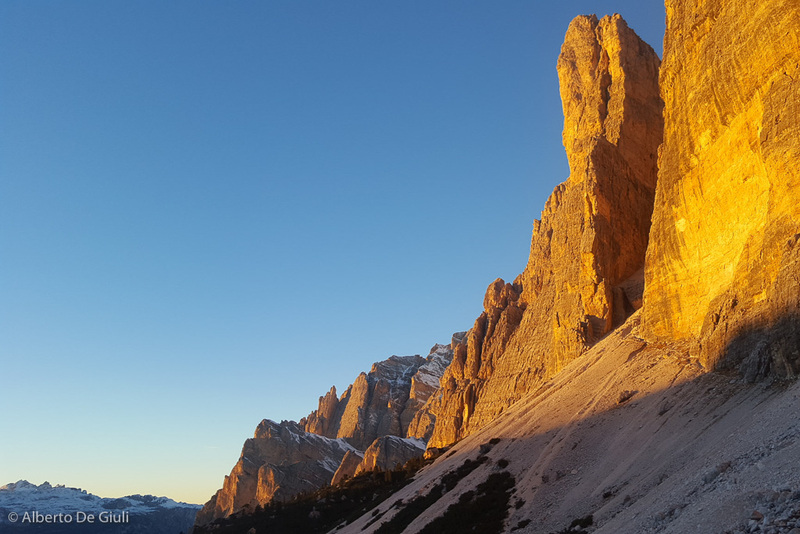 The pastel colors of the rocks, the screes and the yellow painted fields, everything become amazingly beautiful with the sunset lights. 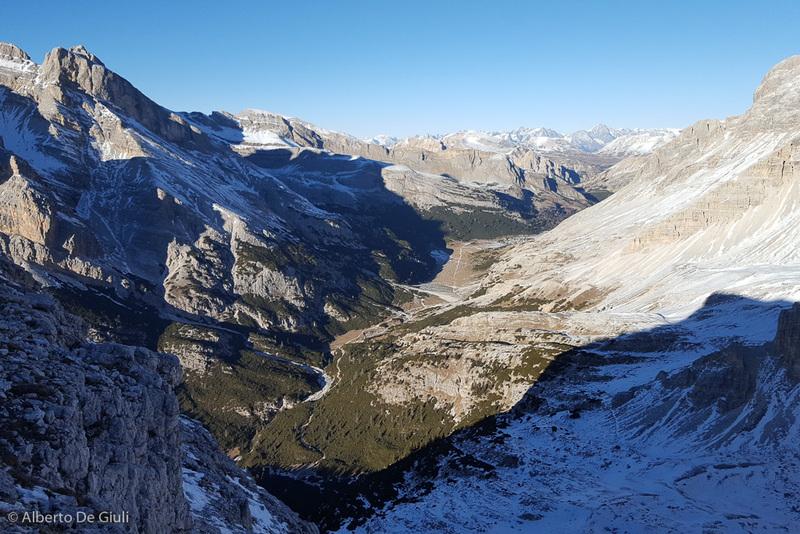 Everything turns red, even the gravel and the patches of snow. 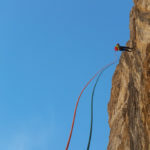 It’s such an unforgettable experience. 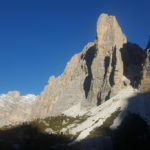 I hope you have some good reasons now to come to the mountains. 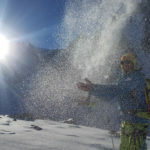 The snow came late last winter, and we did have fun indeed. 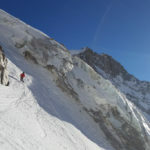 It will come again this winter too. 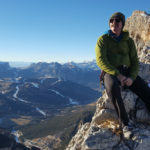 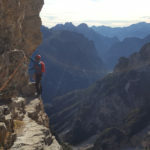 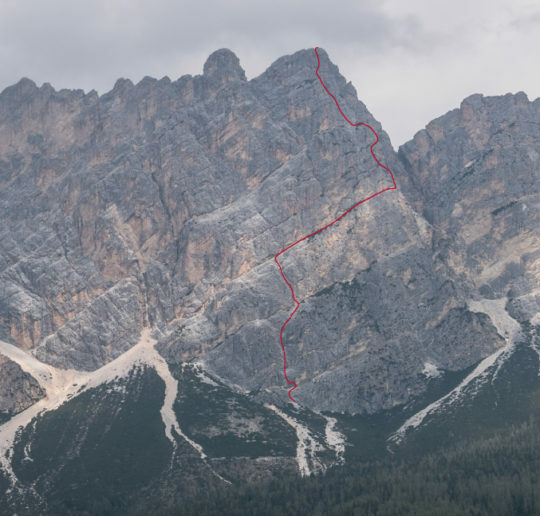 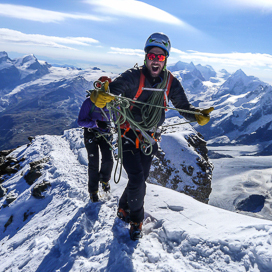 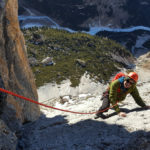 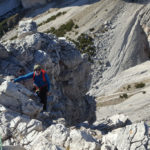 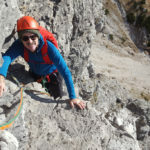 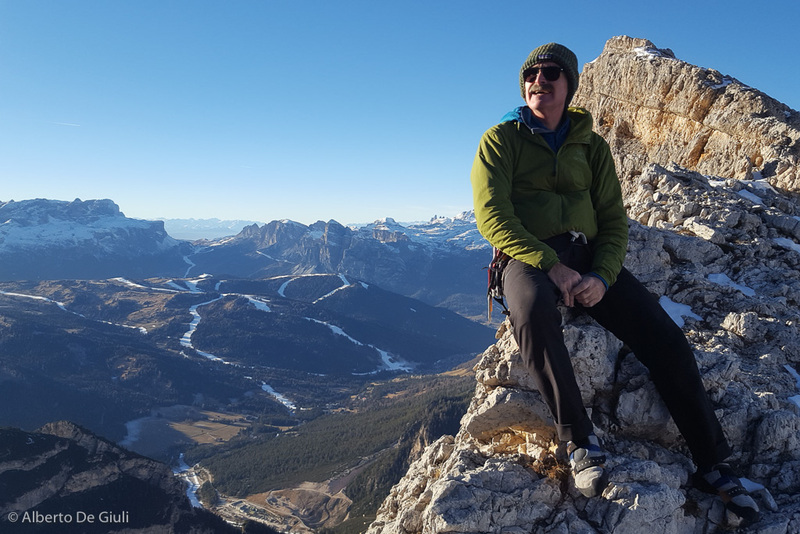 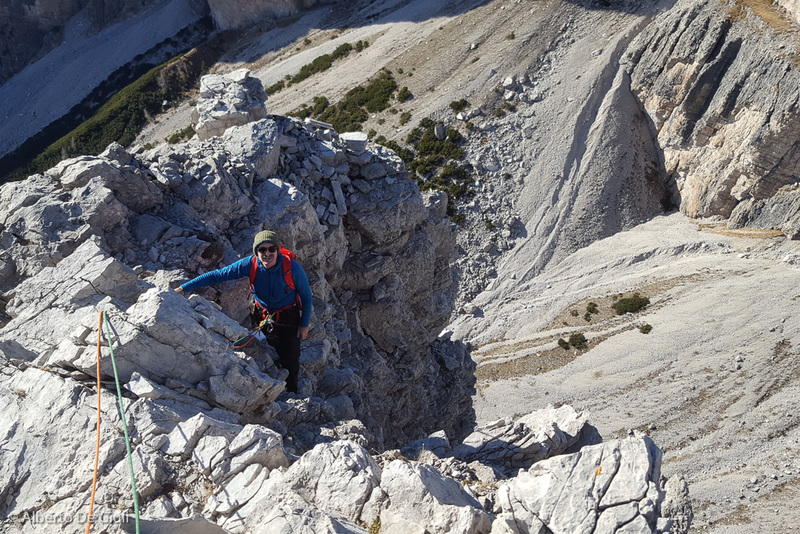 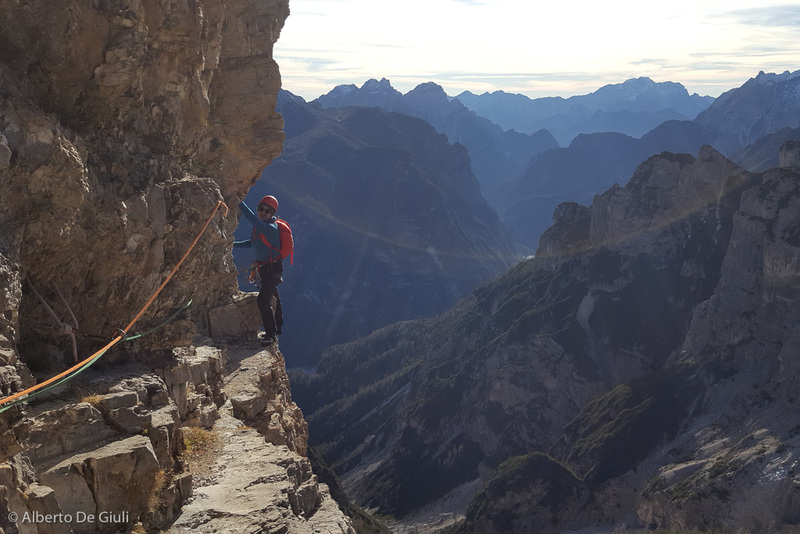 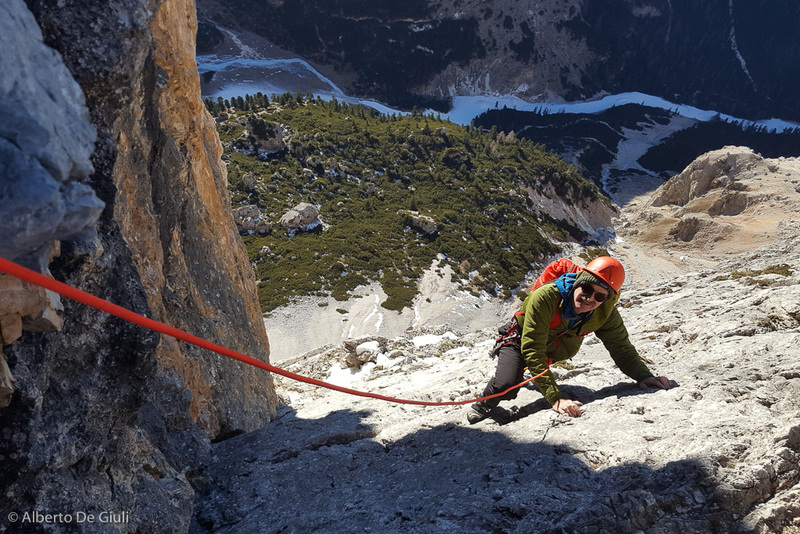 Climbing the Diedro Dall’Oglio on Cima del Lago, Dolomites. 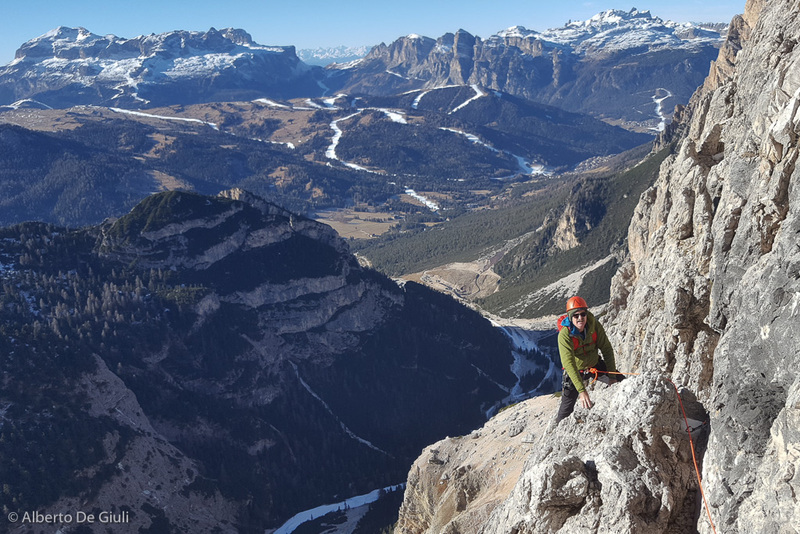 The steep and nice climb on the upper section of Diedro Dall’Oglio on Cima del Lago, Dolomites.